How to optimise inventory management for ecommerce business competitiveness. B2B and B2C businesses, because ecommerce allows both large and small vendors to sell globally to a growing and captive audience. In this post we’ll now discuss HOW small and medium-sized businesses can enhance inventory management processes with inventory optimisation techniques, to help achieve these goals. Inventory management is the business process responsible for ordering, managing, storing and moving inventory. As an element of supply chain management, inventory management supervises the flow of goods from manufacturers to warehouses and onto relevant sales channels. Inventory optimisation is the art of predicting and managing supply and demand variables, whilst undertaking inventory management processes. It allows you to manage your inventory better, by balancing capital investment and service-level goals with demand and supply volatility. The objective of inventory optimisation is to have the right products, in the right place at the right time – as efficiently and cost-effectively as possible. With such different demand patterns, it doesn’t make sense to treat every product the same. In each case the future demand forecasting, replenishment and safety stock calculations need to be treated differently. All of these will help prevent stock outs and are discussed below. The ecommerce marketplace is dynamic. Retailers and wholesalers therefore need to be agile enough to respond to any changes in customer demand – fast! Simply reacting to market change is not enough, because you may have insufficient stock to meet a surge in demand or even miss out on a trend altogether. To be one step ahead, you need to be proactively anticipating fluctuations. By analysing historical demand data and you can predict your future base demand and help prevent stock outs. Demand forecasting is particularly useful for omni-channel retailers, as sales from across every channel can be aggregated to show overall demand for each sku, and then consolidated to produce economical supplier purchase orders. Seasonality, demand trends and promotional activity all impact demand and are important to produce accurate forecasts and ensure product availability. Seasonality: Understanding how the seasons or annual festivals like Christmas or Diwali impact product demand will ensure you don’t lose sales due to shortages during peak seasons, or have expensive surpluses as demand tails off. Trends: Whereas seasonality effects demand on a regular basis causing peaks and troughs, a trend will move demand in one direction over a period of time. Promotions: In addition, promotional activities such as special offers, discounts and long-term price drops will impact the overall demand for your product. In summary, demand forecasting helps estimate the future demand across all your sales channels, to ensure product availability and help drive customer satisfaction. In addition, this information can be shared with suppliers, to improve their service levels and help plan deliveries more strategically – again helping improve cost-efficiency and product availability. Inventory optimisation can help you calculate how much stock to order and when to order it, so you have enough to meet demand without tying up too much capital. Service level – probability of not having a stock-out, or the probability of not losing sales e.g a 95% service level target means you’ll fulfil 95% of orders. Lead time – time it takes your supplier to deliver, from purchase order to stock in the warehouse. Safety stock – stock used to cover any uncertainty in demand during the lead time. Re-order point – point at which the order is placed. Optimum order quantity – amount of items ordered, when taking into account the demand forecast, lead times and any supplier constraints e.g number of deliveries per year, max/min order quantities. By optimising your replenishment processes you can be sure that you’ll have the right products available to meet your expected demand, whilst also carrying sufficient safety stock in case of unforeseen surprises. In addition, you’ll be able to do so without the cost of holding excess stock. 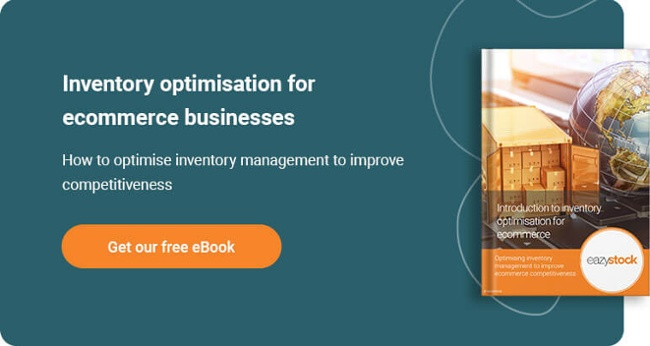 So far we’ve shown how inventory optimisation techniques help ecommerce businesses project their demand and cost-effectively replenish stocks to ensure that demand can be met. The final part of the jigsaw is knowing what products to hold in the warehouse. Fast moving, lower value items that have a high service level should be stocked well, as they are cheap to stock/sell and you want to ensure their availability. In contrast, high value items that are rarely picked may not even be stocked and will be fulfilled to order. By setting stocking rules you can prioritise the items you hold in stock and free up working capital to invest in other areas of the business. Freeing up working capital could be extremely useful for ecommerce companies looking to gain a competitive edge in the marketplace, allowing increased investment in marketing activity, new sales channels or new product lines. By employing some of the inventory optimisation techniques we’ve discussed above you’ll be able to manage your inventory more efficiently and cost-effectively, improving your ecommerce competitiveness as you go. However, inventory optimisation calculations can prove complex and time-consuming, so consider the use of software systems to support. Whilst some enterprise resource planning systems (ERP), warehouse management systems (WMS) and ecommerce platforms can offer a basic level of functionality, investing in specialist inventory optimisation software will ensure you have the tools you need for the job. Software like EazyStock is quick and easy to set up and will do all the hard work for you, so you have more time to analyse findings and make informed, strategic decisions. For more information on EazyStock email us or call 0121 503 2650. First published on 26 October 2017, updated 2019. Supply chain management in ecommerce: Why optimised inventory management is critical to ecommerce businesses.